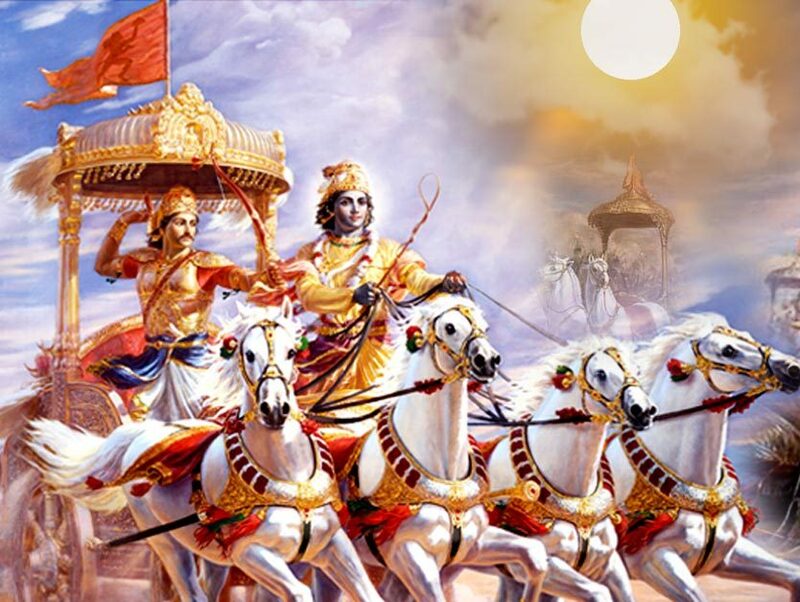 The Bhagavad Gita is part of the Mahabharata, an episode in the vast drama. But it stands apart and is complete in itself. It is a relatively small poem of 700 verses — 'the most beautiful, perhaps the only true philosophical song existing in any known tongue,' so William von Humboldt described it. Its popularity and influence have not waned ever since it was composed and written in the pre-Buddhistic age, and today its appeal is as strong as ever in India. Every school of thought and philosophy looks up to it and interprets it in its own way. In times of crisis, when the mind of man is tortured by doubt and is torn by the conflict of duties, it has turned all the more to the Gita for light and guidance. For it is a poem of crisis, of political and social crisis and, even more so, of crisis in the spirit of man. Innumerable commentaries on the Gita have appeared in the past and they continue to come out with unfailing regularity. Even the leaders of thought and action of the present day — Tilak, Aurobindo, Gandhi — have written on it, each giving his own interpretation. Gandhiji bases his firm belief in non-violence on it, others justify violence and warfare for a righteous cause. The poem begins with a conversation between Arjuna and Krishna on the very field of battle before the great war begins. Arjuna is troubled, his conscience revolts at the thought of the war and the mass murder that it involves, the killing of friends and relatives—for what purpose? What conceivable gain can outweigh this loss, this sin? All his old standards fail him, his values collapse. Arjuna becomes the symbol of the tortured spirit of man, which, from age to age, has been torn by conflicting obligations and moralities. From this personal conversation we are taken step by step to higher and more impersonal regions of individual duty and social behaviour, of the application of ethics to human life, of the spiritual outlook that should govern all. There is much that is metaphysical in it, and an attempt to reconcile and harmonize the three ways for human advancement: the path of the intellect or knowledge, the path of action, and the path of faith. Probably more emphasis is laid on faith than on the others, and even a personal god emerges, though he is considered as a manifestation of the absolute. The Gita deals essentially with the spiritual background of human existence and it is in this context that the practical problems of everyday life appear. It is a call to action to meet the obligations and duties of life, but always keeping in view that spiritual background and the larger purpose of the universe. Inaction is condemned, and action and life have to be in accordancewith the highest ideals of the age, for these ideals themselves may vary from age to age. The jugadharma, the ideal of the particular age, has always to be kept in view. Because modern India is full of frustration and has suffered from too much quietism, this call to action makes a special appeal. It is also possible to interpret that action in modern terms as action for social betterment and social service, practical, altruistic, patriotic and humanitarian. Such action is desirable, according to the Gita, but behind it must lie the spiritual ideal. And action must be in a spirit of detachment, not much concerned with its results. The law of cause and effect holds good under all circumstanccs; right action must therefore necessarily yield right results, though these might not be immediately apparent. The message of the Gita is not sectarian or addressed to any particular school of thought. It is universal in its approach for everyone, Brahmin or outcaste: "All paths lead to Me,' it says. It is because of this universality that it has found favour with all classes and schools. There is something in it which seems to be capable of being constantly renewed, which does not become out of date with the passing of time—an inner quality of earnest inquiry and search, of contemplation and action, of balance and equilibrium in spite of conflict and contradiction. There is a poise in it and a unity in the midst of disparity, and its temper is one of supremacy over the changing environment, not by seeking escape from it but fitting in with it. During the 2,500 years since it was written, Indian humanity has gone repeatedly through the processes of change and development and decay; experience has succeeded experience, thought has followed thought, but it has always found something living in the Gita, something that fitted into the developing thought and had a freshness and applicability to the spiritual problems that afflict the mind. Why Sadachara and Raj-Dharma are paramount values in Dharmic tradition? What are the sources of morals and ethics to create a “Dharmic universe”? What is the source of values that India as a republic state espouses?